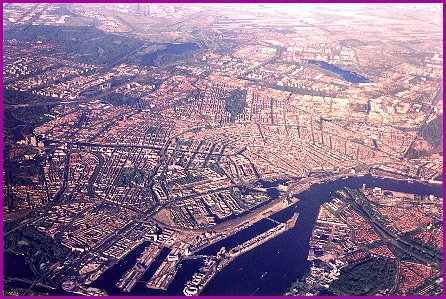 I visited the Netherlands for the first time in the middle 1980s, and instantly fell in love with the country, the city of Amsterdam, and the Dutch people. 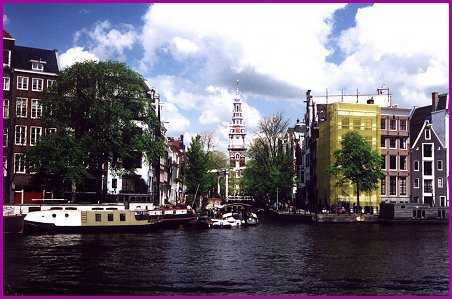 Amsterdam was (and still is) wild, colorful, tolerant of almost anything, and loads of fun. The countryside is beautiful, serene and pastoral. And the Dutch people are unfailingly pleasant and friendly. It took me a long time to get back, but I visited again in May 2001. The Netherlands was just as beautiful and wonderful as it had been the first time. I am sure I will go back to the Netherlands again. 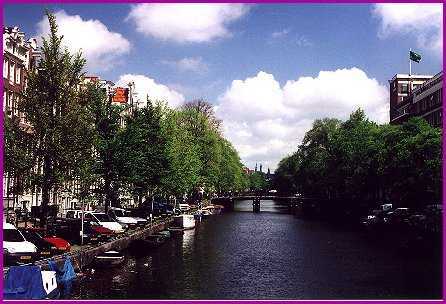 The canals are a central feature of Amsterdam. Since a great deal of the country is below sea level (the Netherlands, Belgium, and Luxembourg are known as the "low countries", also as "Benelux"), the canals were an important way to get around the city. Since suitable land for building houses was at a premium, the homes in Amsterdam are built upwards instead of outwards (sideways). This makes for very distinctive, interesting architecture. 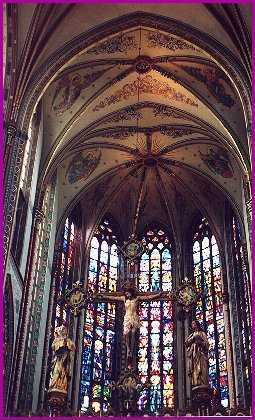 This is one of the beautiful, ornate cathedrals that decorate the city. On the day that I visited them, they were having organ recital day, and in nearly every church I entered was filled with magnificent, booming pipe organ music. It was an unexpected delight I will never forget. On the morning I left Schipol airport for my flight back to the United States, I was treated with this stunning view of Amsterdam. The central city (canal section) is just right of the center of the photo. I could not imagine a better going-away present.